ARLINGTON, Texas – It's difficult to overstate the impact of having a shutdown cornerback on a defense. That type of player gives the pass rush more time to get to the quarterback, minimizes big play ability for the offense and allows the rest of the defense to focus elsewhere. Notre Dame has such a player in Julian Love, the two-time All-American, the all-time leader in pass breakups in Irish history. Then, late in the first quarter of the Cotton Bowl against Clemson on Saturday, he was gone, sidelined with a head injury. When Love exited the game, the Irish were tied with the No. 2 Tigers. When he re-entered the game at the start of the third quarter, Clemson was up by 20, on its way to a 30-3 victory. Losing Love for those five series isn't the sole reason Notre Dame lost, but it was a huge blow for an Irish team that needed to play perfectly to have a chance. Clemson had the ball five times during Love's absence. On three of those drives, the Tigers scored touchdowns, all through the air. After the game, much of the discussion was about Clemson quarterback Trevor Lawrence and the poise he showed in the biggest game of his life. He played remarkably well, throwing for 327 yards and three touchdowns, but the difference in his numbers between when Love was in the lineup and when he left the game is stark. With Love on the field, Lawrence went 14 of 24 for 98 yards and no touchdowns, an average of 4.1 yards per attempt. With the junior corner sidelined, Clemson's freshman quarterback was 13 of 15 for 229 yards, a whopping 15.3 yards per pass, and three scores. With Love sidelined, the Irish turned to fellow junior Donte Vaughn. Vaughn started against Pitt earlier in the season but otherwise hadn't seen the field often. He did not play a single snap against USC in the season finale. Notre Dame forced a punt on the first series without Love, but on the second series the Tigers took advantage of his injury. Freshman receiver Justyn Ross ran a simple go route and Lawrence lofted a perfect throw down the right sideline. Vaughn was a half-step behind and then stumbled as he tried to make the tackle, giving Ross the chance to streak 52 yards for a go-ahead touchdown. Later in the quarter, Love's absence bit again, this time indirectly. 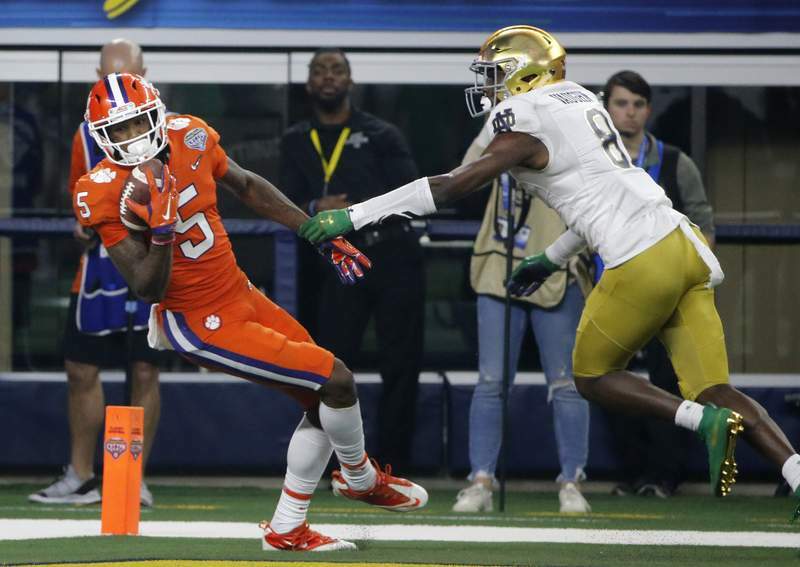 Vaughn was covering Clemson receiver Tee Higgins and the Irish sent linebacker Drue Tranquill to bracket Higgins in coverage and take him away. That left safety Alohi Gilman one-on-one with Ross, who beat him and snagged a 42-yard touchdown pass from Lawrence. The third Clemson touchdown came in the final seconds of the first half. Vaughn was again covering Higgins and the corner was in good position in the back of the end zone. When Lawrence floated the ball that direction, Vaughn looked back and got a hand up to try to knock it away. Instead, he merely deflected it into the air, giving Higgins a chance to grab the ball with one hand and make a highlight-reel reception. After the referee signaled a touchdown on Higgins' catch, Tranquill went over to give Vaughn some encouragement. By then, however, it was 23-3. Love said that he felt ready to go back in near the end of the second quarter, but with a head injury there are certain protocols that players have to pass to be cleared to play. Love didn't pass the memory test until halftime and so could not return until the start of the third quarter.